« How Highbury Stadium was built in just ten weeks. At the start of December 1923 Arsenal League table at start of the month in 16th, four points above the relegation places. Arsenal ended up with nine games to play in December: seven scheduled for the league and at least one (but as it turned out two) for the London FA Challenge Cup. The programme stated with a home league match against Blackburn on 1 December. The crowd was much below average being recorded at just 20,000, because of the swings in temperature which themselves brought sudden arrivals of fog. Arsenal made two changes with Milne and Woods added to the team with Baker and Butler dropping out after the disappointing 0-3 defeat to Tottenham. The result was a 2-2 draw; not as good as hoped for but nevertheless a point against a middle of the table team. Young playing at centre forward finally got his first goal of the season in his seventh match (although one of these was at inside left). Also notable was that the club was down to three of the back six that had rescued the team the previous season, Robson, Mackie and Milne being all that remained. On Monday 3 December Sir Henry’s lawyers obtained a writ for libel against Edward Armfield for his comments in the Fulham Chronicle. Sir Henry was no slouch when it came to economic policy, and certainly not a blind follower of the Conservative Party’s position. His article as an ex-MP was welcomed by the local press, and indeed the Times, not because it was Sir Henry writing but because it made a well argued case as to why free trade was important to Britain’s recovery. He criticised the Conservative’s plans as being vague, particularly in terms of which imports should be excluded from tarriffs. He also felt that the Tory policy had a lot of wishful thinking in suggesting that protectionism would cure all unemployment. Sir Henry argued that free trade kept prices down and that duties on imported goods would do nothing but put prices up. But mostly he criticised the lack of information on trade that the government was giving voters – a very reasonable complaint indeed. The publication of the letter in the Fulham Chronicle on 30 November 1923 was fair enough – it seems Sir Henry had given his permission for this, and it was clearly newsworthy as Sir Henry had been a Conservative MP for the Borough. But then the Chronicle went further claiming that as a result of the letter and its publication “a torrent of wrath” had been unleashed on Sir Henry by the local Conservatives. Using the age old newpaper trick of quoting an unnamed source as calling Sir Henry “a disgruntled and embittered man” who acted from “personal malice” the paper was trying to discredit Sir Henry, and to be able to hold up such a claim they would need evidence. Such evidence of course can rarely be found unless the perpetrator admits to it – and who admits to acting from personal malice. So when on 3 December 1923 Sir Henry’s lawyers obtained a writ for libel and an injunction forbidding any further repetition of the words quoted in the Chronicle, they knew, as did Sir Henry, himself a veteran commentator, that they would win hands down. We have no indication of the Chronicle tried to settle with Sir Henry – I imagine they did because they must have known they were on to a loser. The case was so open and shut it is quite remarkable that the Chronicle had allowed itself to get in this position. The defendants apologised, expressed regret and Sir Henry was awarded costs and 100 guineas as damages. Sir Henry, as always, gave the money to charity. That would be about £6000 in today’s money. Sally Davis, commenting that this was the end of Sir Henry’s career in politics calls the career an anything but glorious one. I would beg to differ. True, Sir Henry had remained as an MP for just one Parliament, choosing not to stand thereafter, but throughout his time in Westminster he had stood up for what he believed in, and made a serious and honest attempt to curtail the way working class men were being hoodwinked by bookmakers. He had argued his case for equal pay for women vigorously both in the LCC and Parliament, and had promoted the cause of injured soldiers returning to the country that they had fought for, only to be reduced to begging on the streets. As a councillor in Fulham, he had been elected mayor after just three years in the chamber, and had become the Borough’s longest serving mayor of all time. His administrative genius had meant that Fulham became a shining beacon of organisation when it came to recruitment in the Great War both during the volunteer period and after conscription. In this brief resume I have excluded his work raising the footballers battalion and his most distinguished period within the War Office both during the war and in his work in decommissioning soldiers upon their return. And let us not forget Sir Henry was the voice arguing against the utterly disaster of bringing conscription to Ireland. If his voice had been listened to, it is quite likely Ireland’s history would have been quite different, and a lot less blood would have been shed. It is perhaps most interesting to note Sir Henry’s views on free trade at the moment I write this in 2018, when protectionism and isolationism is once more raising its head. I wonder what he would have made of today. Meanwhile with the writ served on 3 December the semi-final of the re-run of the London FA County Cup was held. This time the fog held off and Millwall Athletic despatched 2-1. As before the team was primarily the first team members who were not injured, with Clarke being the only outsider given another run out. As for the general election was held on 6 December and the Conservatives won the Fulham seat previously held by Sir Henry. The Fulham Chronicle said that the legal battle between Sir Henry and the Conservatives as the highlight – the rest of the campaign was seemingly very subdued. Nevertheless the decline in the Conservative vote must have concerned some members of that party. In 1918, Sir Henry Norris had won 69.4% of the vote, with Labour in second place on 19.5%. In November 1922 the Conservative vote was still dominant but down to 61.5% of the voters, with Labour up to 35%. Now in 1923 the result was Conservative 43.9% of the vote, Labour 34.5%. In just four years 25% of the people who voted had moved away from the Conservative Party. The writing was on the cards but it seems the Tories didn’t read the cards. As a result by 1933 Labour had taken the seat, getting nearly 60% of the vote. Now returning to our timeline, sometime in the first week of December Sir Henry had an operation. We aren’t told what it was for but by the end of the first week of December the local paper reported he was making excellent progress towards recovery. It is indeed frustrating as a biographer not to have this piece of information, for we have seen Sir Henry become ill in recent winters, convalesce in Italy and France, move away from his business interests in building and renting houses, pull back from politics and indeed everything else he was interested in. He had now dropped out of politics, and as we have seen was perfectly able to leave Arsenal for months at a time. I think we can say he had already started to treat his health issues seriously, although as we shall see, when he felt himself to be wrongly accused he still had the drive and energy to fight back. The next Arsenal match was on 8 December against Blackburn away. Arsenal had now gone four without a win, and the least that was hoped for was a second draw against the middle of the table club, but it was not to be. Knighton brought back Voysey and Haden, but the result was a 2-0 defeat. The following monday 10 December saw the final of the London FA Challenge Cup at Upton Park, in which Arsenal played Charlton, beating them 3-1 to take the trophy. There was one newcomer to the team – Irving – and Young (2) and Haden got the goals. Of course despite the pleasure at winning a trophy Arsenal were more conscious of the dangers of a continuing run of games without a win – the eight in a row last season had brought Arsenal to the very edge of relegation. Unfortunately Arsenal now had two games against Huddersfield Town who had joined the first division in 1920. In their three seasons to date they had come 17th, 14th and 3rd and had won the FA Cup in 1922. The work Herbert Chapman was doing at the club which had never won any trophy before that FA Cup triumph was considered little short of miraculous given the paucity of their resources. Their average attendance this season was 17,395, compared with Chelsea who got an average crowd of 30,895. A big difference especially when one notes that Huddersfield ultimately won the league and Chelsea were relegated! Arsenal were still playing with a make and mend side – just three of last season’s back six being in the team. Indeed only five of the opening XI played – and two of those were played completely out of position. However having gone nine without defeat Huddersfield had just lost their last two away games – to Bolton and Sunderland, and as a result had dropped down to third, three points behind Cardiff who were still at the top of the table. Although unbeaten at home they had lost four times away. Arsenal had a chance – at that is how it might have seemed. But even with Dr Paterson back in the team Arsenal lost 1-3 to make it three defeats and three draws in the last six league games. This was the sort of decline Arsenal had had in each of the last few seasons, and next up it was Huddersfield away. Sir Henry, perhaps still recuperating from his operation, or perhaps taking up his duties as director overseeing the reserves wasn’t at the match Highbury although the rest of the board were to receive the FA International Selection Committee. According to the Times the match only lasted 45 minutes as a contest after which what the Times called Huddersfield’s clever forward line ripped Arsenal apart. As a result of their win at Highbury, Huddersfield were back in second position, and having scored almost twice as many goals as Arsenal while conceding ten fewer. The omens did not look good, and the omens were right Arsenal losing 1-3 although rather amusingly the Times quoted the score as 1-4. Mind you, as part of their anti-football campaign in 1915 they had sent a reporter to cover an Arsenal game, and he wrote about the very tiny crowd – failing to realise that it was a reserve game he was watching. Wilson for Huddersfield got a hattrick in that game and he must have been looking forward to Huddersfield’s next match: Arsenal at home. For Arsenal, Kennedy, one of the five star back six, returned for the return game in Yorkshire on 22 December but it looked like a gamble and he was injured in the second half and out once again until February. Butler at centre half was playing his second game after his return but he too was unfit, and he too got injured after half time and was now out until February when bizarrely he was brought back for two matches at centre forward. (He failed to score). At half time, before the injuries, it was 0-1, just as it had been at Highbury, but the injuries caused Arsenal to crumple, and Town ran out winners 6-1. The crowd however was only 15,000, 10,000 fewer than had turned up the week before for the game at Highbury. Charlie Wilson got his second consecutive hattrick on his way to being top scorer in the club for first first of three years running. That made it three defeats in a row and no wins in the last seven games. Arsenal were 17th and back in the relegation dogfight (they were two points clear of Middlesbrough). Norseman in the Daily Gazette reported himself worried about the defence, and that was fair enough. Arsenal had played 20 and let in 33 goals – only Nottingham Forest had let in more (35). And we should remember that it was at this time that the International Board was debating whether to change the offside rule from three players behind the attacker to two. (That rule was changed in the summer of 1925). But there was, I am sure, far more to those two defeats to Chapman’s Huddersfield than misery for Arsenal. Sir Henry didn’t have to be at the games to appreciate the point. Huddersfield’s income was under half of that at Arsenal, and yet they had built a team under Chapman that looked capable of winning the league. It wasn’t all about money, as Knighton later stated. It was about an ability to find the right player and to blend him into something more than he was before. This was, for me, the moment the transformation of Arsenal started. Arsenal did not play on Christmas Day this year but played instead on Boxing Day in a game against Notts County who were sitting comfortably in mid-table. 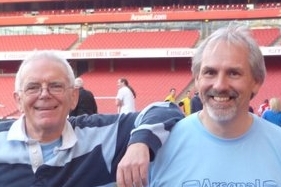 And surprisingly, after the dreadful seven match run Arsenal beat County 2-1 with Woods and Blyth getting the goals. Although Butler and Kennedy were out again in terms of the defence, Milne returned and did his job. The defence suffered no more injuries. As was the norm at the time, the clubs then played each other once more the following day at Highbury and it is for this match that we see that all was not well in football reporting. For in his commentary in the Islington Gazette, Norseman wrote about a “strange re-arrangement” of Arsenal’s line up. And yet this was the same team that beat Notts County away, with but one change. Dr Paterson, making himself available for the game, played for the second time at outside right allowing Haden to continue on the left wing. Indeed it was one of 12 Dr Paterson appearances on the right during the season. The result was a goalless draw against Notts County in front of a modest 16,000 and that was two games without defeat meaning Arsenal now had a chance to make it three with a Highbury fixture against Chelsea who were now 20th and two points behind Arsenal. In the week after Christmas the Football League Management Committee decided that they would not put the notion of a limitation on transfer fees on the agenda for the Football League’s AGM. It was a defeat for Sir Henry Norris’ notion that it was the transfer fees not the players’ wages that should be limited. He was some forty years ahead of his time. The final game of the year resulted in an Arsenal victory over Chelsea 1-0. The Times noted that both teams were suffering injury crises and certainly Arsenal ended the year with a team quite different from the one they started with. Just four players from the opening game of the season played in their rightful positions for this match. Another three played in completely different positions (Baker from left wing to left back, Woods from inside left to inside right and Young from inside right to right half. Arsenal had remained in 16th place, four points above Chelsea in the relegation position. But the most notable change came with Preston who had won three matches in the space of one month having only won one inthe whole of season up to this month. They were still bottom of the league but closing the gap. The year ended with the BBC broadcasting the chimes of Big Ben for the first time. This series of articles on Henry Norris will continue shortly.